The transition seasons – autumn and spring – have always been my favorites. I enjoy the slowdown that happens in my work during autumn. Even more, I enjoy the new life that coincides with springtime. This year, after what has seemed like an unusually cold and wet winter in the Sierra Foothills (but which, by historical standards, is probably “normal”), I’m especially enjoying the onset of spring! Our entire sheep year revolves around six weeks of lambing. 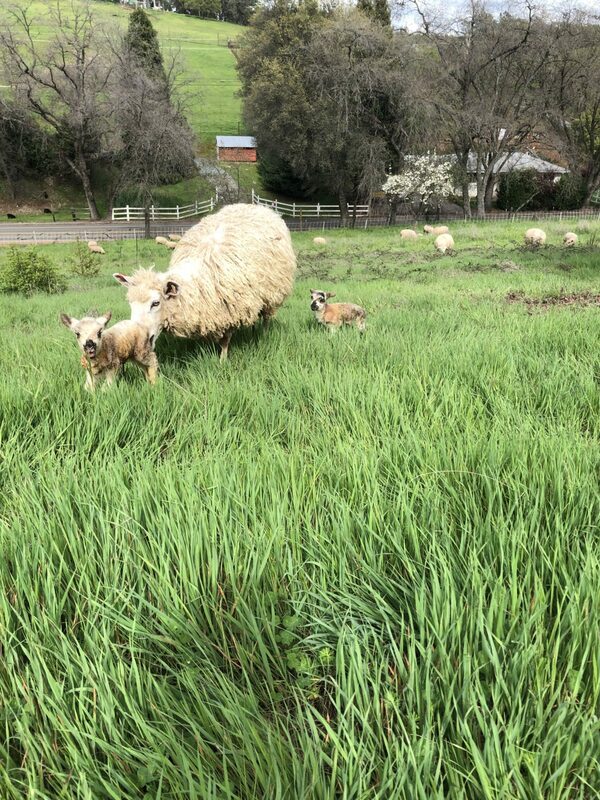 We time our breeding season to ensure that lambs arrive in late winter and early spring – just as the grass in our Sierra Foothill rangelands is starting to grow rapidly. 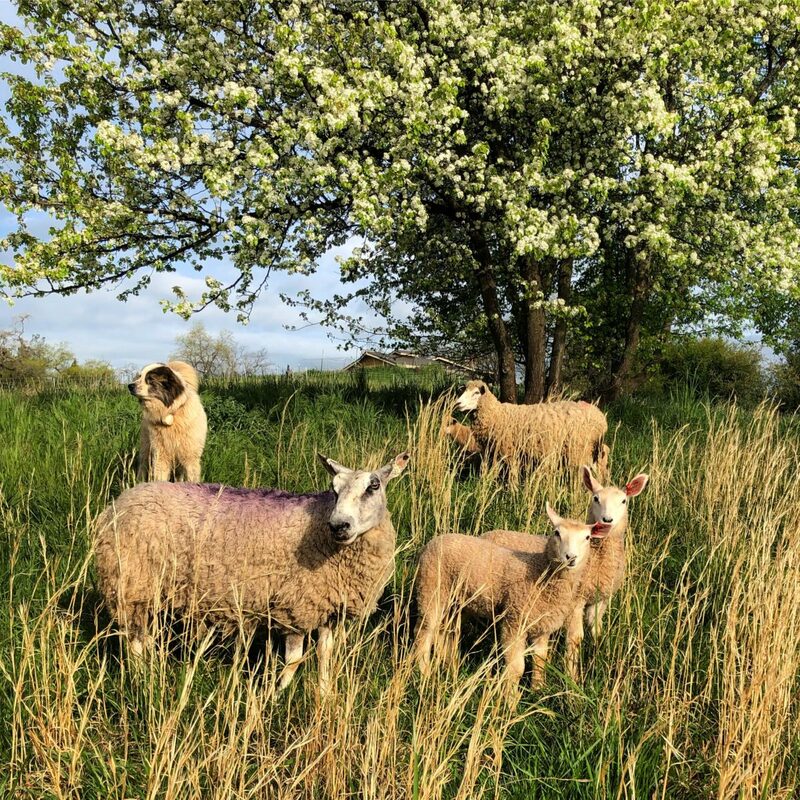 A ewe that is nursing twin lambs needs almost twice as much green grass in her diet as a ewe that doesn’t have lambs – and so we want our new lambs and the new grass to arrive at roughly the same time. Usually, by early March, the days are long enough and the temperatures (both soil and air) are warm enough that our grass starts to grow rapidly. This year was different! As I’ve traveled about foothills and the eastern Sacramento Valley in my “day job” as a UC Cooperative Extension livestock advisor, ranchers have remarked that the grass was short, despite higher-than-average precipitation. Colder temperatures and cloudy skies have resulted in a later start to our typical spring flush of grass. After experiencing a once-in-a-lifetime (I hope!) drought, I swore I’d never complain about rain – but I’ll admit to being tired of the mud. However, the sunny days and warmer temperatures of the last week or so seem to be kicking our grass into high gear! Once we finish lambing, we move our flock from the lower elevation rangelands where we lamb back to our irrigated pastures closer to Auburn. By grazing these pastures now, we’ll keep them productive and nutritious through the late spring and summer. Shipping the flock involves bringing all of the sheep into the corrals and putting them onto a gooseneck trailer. Since this is the first time through the corrals and on the trailer for the new lambs, the work is slow. With lambing season behind us, our attention turns to our spring work. In mid-April, the Nevada Irrigation District begins delivering our irrigation water. In the coming week, I’ll flush our irrigation system and check our sprinklers in anticipation of irrigation season. Once the water starts, I’ll spend an hour or so of every day moving water across our irrigated pasture; green grass through the summer keeps our lambs growing and helps prepare our ewes for next year’s lambing season. But for now, with the sheep moved and our irrigation water yet to arrive, we’re enjoying a bit of a breather. We’re enjoying a beautiful spring!